I am pretty disappointed that we could not do the Pennywise Eat Local Challenge here. We were having this great early spring, it all looked just right for fresh produce, early in the season. Then out of nowhere, well, the Northwest actually, came this freeze with three days of lows in the teens. Brutal. So many lost plants and replanting. I woke up to the first open day of farmers markets to snow on the ground. The Midwest is a hard place to be a farmer indeed. Here is it May, and the past weekend at the farmers market yielded little in variety for vegetables. I did find all my herbs and plants, but otherwise, the early spring lettuces were nowhere to be found unless you count the greenhouse-grown plants for sale. I did find two large plants of leaf lettuce for $2.00 each. The grower said I should get about four cuttings, making my investment $4.00 for eight heads of lettuce. Not bad. The other items we found, much to my relief, were scallions, and green and purple asparagus. 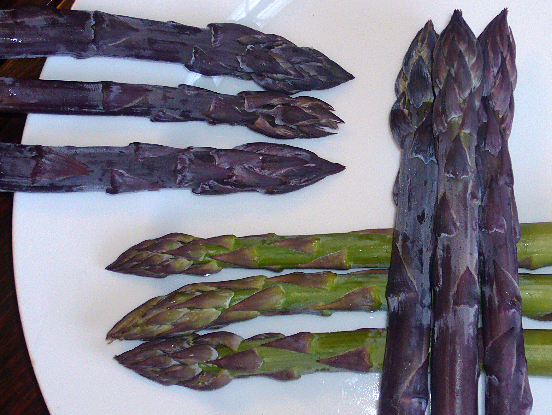 The purple asparagus is a treat, milder and sweeter, and only to be had for these first weeks of the season. I was worried that it was lost for the year. As we head into May, the produce we should have had in April will start to show up. Lettuces, Chard, Kale, Radishes, Beets and more Asparagus. I had posted my spring greens recipes in anticipation for April. Looks like I will just now get to make these recipes with local produce.